We’d love your help. Let us know what’s wrong with this preview of Year of Wonder by Clemency Burton-Hill. Classical music for everyone - an inspirational piece of music for every day of the year, celebrating composers from the medieval era to the present day, written by award-winning violinist and BBC Ra As featured in the Telegraph and on Radio 4's Today programme. To ask other readers questions about Year of Wonder, please sign up. Will there be a you-tube playlist for this? I'm not on itunes, so won't be able to get that version, but would really love to follow the 'official' version. I searched for today's piece myself on youtube, and the first one I listened to was awful. I tried another version of the same piece, and it was lovely. I don't fancy repeating this experience every day! This was a wonderful journey. I listened nearly every day and loved some of the new suggestions and disliked others. Although I'll rate and review it before then, don't expect me to finish this book for exactly 365 days from now, as I'm definitely using this book as intended – enjoying a single piece of music and its accompanying one-page write up each day! I'm hoping that between YouTube, Amazon Music, Hoopla, and my local library, I won't have too much trouble finding all the music referenced.
" . . .I believe that music holds the mystery of being alive. These pieces, some of which are just a few minutes long, can do so much with so little. They become friends, they become teachers, they become magic carpets. I feel, in the company of the greatest music, recognized, seen, held. Engines of empathy, they allow us to travel without moving into other lives, other ages, other souls." Obviously, music and literature have everything in common. They are both universal langua " . . .I believe that music holds the mystery of being alive. These pieces, some of which are just a few minutes long, can do so much with so little. They become friends, they become teachers, they become magic carpets. I feel, in the company of the greatest music, recognized, seen, held. Engines of empathy, they allow us to travel without moving into other lives, other ages, other souls." Obviously, music and literature have everything in common. They are both universal languages that travel across any border you could come up with. 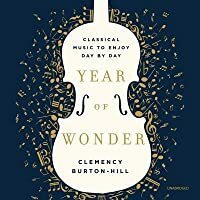 Year of Wonder, courtesy of Clemency Burton-Hill provides a hand curated treasury of music for every day of the year; 366 works by more than 240 composers from medievalists to the twenty-first century. When I opened my copy to the 8th of July (today), I was joyously offered up the Gladiolus Rag by Scott Joplin. As an African American who was exposed to minimal classical music as a child and who is now enraptured by all things classical, this was wondrous for me. Year of Wonder is the book I need, indeed it is the book for everyone, those who merely want to dip in occasionally and those like me who long for immersion. I cannot recommend Year Of Wonder highly enough. Clemency Burton-Hill is an angel. Revel in music and literature and discover bliss. Did not read this so much as skim it -- it is not what I was expecting. -- This book would make a GREAT gift to give someone who wants to learn about classical music or for the person who already loves classical but would like to expand his/her horizons. The selections touch most of The Greats, but there is a definite whiff of political correctness about the contents (although the inclusion of so many female composers is a definite plus). Wonderful book that makes you get acquainted with classical music in a fun way and not only from famous composers. Each day of the year one piece of classical music. An interesting concept, and a good way to discover some great music (and some not so great too!). The book itself was interesting to begin with, but got a bit tedious as the year progressed. I finished the last couple of weeks in one go, so I can pass it on to someone else before the new year starts. As I read this book, really got the sense of wonder Clemency Burton-Hill has for music. A book that either someone familiar or not familiar with classical music would enjoy. Am going back and reviewing entries a day at a time just for fun. Add a subscription to a music-streaming service like Spotify, Pandora or Apple Music, and they’ll be able to create playlists of classical music suggested in Clemency Burton-Hill’s comprehensive and thoroughly pleasurable volume. The Brit author, broadcaster, musician and journalist takes the guesswork out of what to listen to, suggesting one musical piece for each day of the year. There’s a variety of composers included, from the medieval age to the modern, music ranging from the exuberant to the more somber — something to satisfy the taste of classical novices and classical experts too. With each suggestion, Burton-Hill offers information about the music or composer — entertaining quips, oftentimes stories and little known facts that make the gifted composers seem like ordinary Joes and Josephines. While Bach, Chopin, Beethoven and the like are represented there also are a bevy of less well-knowns. In many of the entries, Burton-Hill suggests a piece on a date that’s significant to the music, the birthdate or death of the composer, the independence day of a particular country and the like. In the introduction to “Year of Wonder,” Burton-Hill, admits that though she’s been steeped in classical music as a broadcaster on Britain’s “Breakfast” show on BBC Radio for many years, she continues to discover composers and music she enjoys. At the urging of listeners to her radio program, who have asked her to suggest playlists, Burton-Hill wrote this book. Included is a month’s worth of selections, 30 pieces of music from September, which can be downloaded on Apple Music. One of Burton-Hill’s goals in writing “A Year of Wonder” was to spread her love of classical music and help ease the highbrow stigma associated with it. Her research and ofttimes humorous voice, puts readers at ease, making this welcome volume fascinating and educational. First book finished for #readathon (I only had about 150p left). This is a really solid one-piece-per-day devotional, if you will, designed to dive deep into the classical music catalogue. A few of my favorites are missing (Rhapsody in Blue, where are you?? Enigma Variations? Any ballet music?) but there were a lot of new-to-me composers to explore (starting right away in January with Hildegard von Bingen). Burton-Hill has also very consciously tried to make an inclusive list to try and get outs First book finished for #readathon (I only had about 150p left). This is a really solid one-piece-per-day devotional, if you will, designed to dive deep into the classical music catalogue. A few of my favorites are missing (Rhapsody in Blue, where are you?? Enigma Variations? Any ballet music?) but there were a lot of new-to-me composers to explore (starting right away in January with Hildegard von Bingen). Burton-Hill has also very consciously tried to make an inclusive list to try and get outside the white/male boundaries classical music has tried to keep around itself. What I think this collection is missing are some recommendations for which recording to listen to. Some more recent or less popular will have fewer to choose from but something like “Che gelida manina” from La Bohème will have hundreds available. Thank you so much to Harper Books for sending me a copy in exchange for my honest review. This book is a devotional for classical music. Every day is a piece of classical music that you can listen to and enjoy. A small written note by Celemency herself (a famous and talented musician) is written about each piece that shows her love of music and wealth of knowledge. I have gone few multiple pieces to listen to and have been in love with every single one of them. I really appreciate how Clemency has expressed the importance of listening to classical music for every person. She brings up the stereotypical idea that people have to be in silence, sitting on the couch, and in the mood to listen to classical music. She encourages people to listen to these pieces in any environment because it will enrich your lives no matter what. I will be getting this book for many friends and family members because I love it so. You perhaps don't know this about me, but I LOVE classical music. I love playing it, listening to it, the history behind it, all that good stuff. So when I heard about this book, I was all over it. I checked it out from my library and I LOVED IT. The song selections were WONDERFUL, I loved getting to learn about little tidbits of history behind the composers and their pieces, and for me, listening to classical music is just so relaxing and cleansing. Even if you aren't into classical music, or you think it's too 'hoity-toity' or 'stuffy' for you, I'd recommend giving this book a try. If you're not musically inclined, some of the language may go over your head, but it's my firm belief that EVERYONE can enjoy classical music, no matter your background. You just have to give it a try! You don’t need a background in music to enjoy this one, just an open mind, open ears, and an interest in learning more. 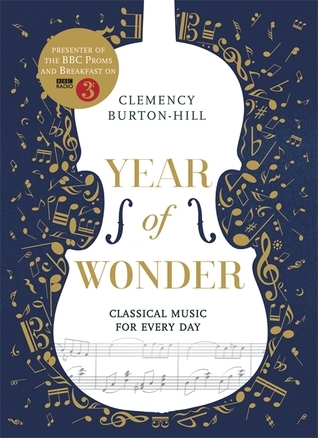 YEAR OF WONDER by Clemency Burton-Hill introduces you to one piece of music each day for the whole year pulling from across genres, time periods, countries and composers. I have not read this book in its entirety as I’m reading a page or two a day, and listening to this music as I go along. Personally, I’ve been thoroughly enjoying the selections. This is amazing book with spotify playlist available. Wonderful stories accompany the musical choices for each day of the year. Truly a gift! Very deliberate choice of the pieces due to historical facts for many of the selections. The author is a wealth of information. Just a delightful part of each day! Disappointed. I want to listen to the piece of the day each day but it turns out you have to pay for Apple Music. Even if you do that, you get a “playlist” that doesn’t tell you which day you’re on or how to hear only the one piece at a time. Classic case of bait and switch, and computer complexity. If you want to discover new classical music to listen to, look no further. Accessible enough for the absolute beginner, yet diverse enough to warrant attention from the most ardent fan, this really is a great book. I haven't read the whole book, but I am working through it. I love knowing a place to start with classical music. I pull up a musical listening website or app, start with the song listed, and pick an album or play list with the song included. An unexpected surprise! Most of the pieces presented are recognizable classics, but every once in a while a superb unfamiliar piece will pop up that will absolutely astound. The accompanying stories are interesting as well. I love it for bringing into the spotlight music you would otherwise not be exposed to. It is a wonderful idea and I really liked the historical bits that she included with the song recommendation for the day. My only qualm was how was one supposed to track down all the music? Youtube? I feel like a cd/ mp3 or playlist should have been included or linked to for the book. this book presents a wonderful excuse to explore pieces of music that your have never come across before or have long forgotten. The short, insightful explanations for the daily choices are very informative. I’m going through my vinyl classical collection and have located many of the suggestions. Enjoying it so far, though I only purchased it a couple of days back. I had to return my copy to the library. Worth buying. Love this and the corresponding Spotify playlists. This made me discover a breadth of classical music. I love that Spotify has pre-created lists that allowed me to listen and read. Wonderful way to be introduced to classical music. If you believe that music enhances your life, this daily dose might be for you. However while this playlist Includes a piece for every day of the year (365), there is no music is included. I bought this for my husband for his birthday, he loves classical music but isn't an aficionado so this book is perfect for all levels of interest. A little piece of classical music for every day of the year with some explanation and the best purpose or situation according to the author. It was a way to find out new music, but it is a real pity that there is only the apple link to the music. Un brano di musica classica per ogni giorno dell'anno, corredato da una breve spiegazione e dai consigli dell'autore per meglio gustarlo. Un modo simpatico per scoprire nuova musica, peccato che però ci sia solo il link all'apple store e non uno a spotif A little piece of classical music for every day of the year with some explanation and the best purpose or situation according to the author. It was a way to find out new music, but it is a real pity that there is only the apple link to the music.